The unique reference field is designed to be used for your organisation's internal document reference numbers. Don't be scared of it, please use it. If you don't have a numbering system, for FOIs or any other kind of publication, then we've previously suggested one that you might care to adopt. We are imminently going to be adding the data from these fields into the search index, so users can search for publications by the content of this field (or the other bibliographic fields, like the ISBN). More generally, if you don't know what the convention is for something like this, please don't guess. Ask. You can ask the GOV.UK team anything like this using the support form. It would be better still if you were to compare notes with other departments and come to us with a collective view of what you think would be a good, consistent way of doing things. Update 19 July: we have now corrected the style guide to reflect this instruction, after a few of you pointed out a contradiction between the style guide and this post. Also to clarify that we do not expect you to retrospectively apply this to existing FOI releases - please just use the reference field from now on. Thanks all. We recently asked about this very thing (probably a month ago) - and we were told to put them at the end of the page title. This is why you'll see them popping up on DfT, DVLA and DSA FOIs. What's your take on changing any that have been published in this format? Can they be left or do they need updating? Sometimes we get a number of FoI requests on the same subject, but we don't necessarily publish them at the same time. Adding the reference number to the title can help to differentiate them. Thanks both - I must admit I wasn't aware of that addition to the style guide, my bad. It was agreed to add that temporarily because search did not index the reference fields. Now that we are imminently fixing that, we have amended the style guide to remove that instruction. You should use the unique reference field from now on, as per this blog post. We do not expect you to retrospectively change existing content. Just use the reference field from now on. If we're publishing them as an HTML publication, how would you like to play it? Until the story is delivered to make HTML publications act like attachments, I don't think there's any way to assign a document reference number to them. Tbh I'd say omit the reference number completely if using html pubs (which are still in beta phase compared to the other formats we have) until we have a field you can put it in. It's only metadata. Putting it into the title, body or summary feels very wrong to me. In MOD we often release a bundle of documents as part of a release (published together on a publication page) under a single reference number. If we use the new number system each PDF file in the release would carry the same 'unique' reference number. This might be confusing for users. We would like to put in the reference number in the Detail section only. Please don't do that. Use the reference number field. It is fine to repeat the same number across multiple files if that is how you have numbered them internally. It doesn't display the word "unique" on the frontend, so there's no reason not to do this. (Although I suggest it would be better to change your internal processes to have a separate number for each file). You could also consider uploading the documents as a Zip file on a single publication page, so there is only one attachment on the page and it has the one reference number. So there are a couple of things to say here. 1. Please don't put the body of a publication into the "body" field (which renders on the site as the "publication detail"). The purpose of this field is to explain what the publication is about, it should never contain the meat of the document itself. You can use the HTML publication field for that. We are imminently going to make it invalid to publish a publication which has neither an attached file nor an HTML publication, in order to prevent exactly this kind of thing from happening. Please make sure the whole team there understands that this is not how the format should be used. 2. We will shortly also be making HTML publications behave more like attachments, which will include the ability to specify reference numbers for them. 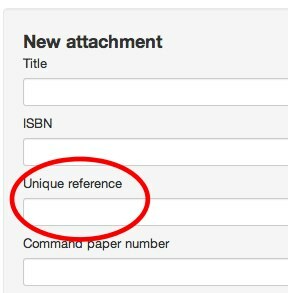 Until then, you're right: you can only currently add these reference numbers for publication attachments. While you wait for these changes to arrive please just add the reference numbers into the body (publication detail) field. When are you going to to enable the search by unique reference - this was promised and never delivered. Sorting through FOI's are a nightmare without this function enabled. That's still our intention. We have a long list of feature requests, but it will get done.